Kindergarteners touching the skunk and squirrel fur. 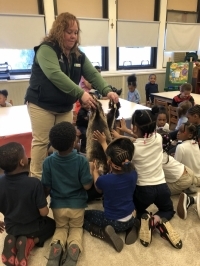 The preschool and Kindergarten classes at St. Jerome school welcomed Miss Phoebe from the Cleveland Metroparks on Monday, May 7th. Miss Phoebe is part of the animal adaptations program. The program teaches children about different animals and the structures they have on, or in, their bodies that influence their survival. She brought in various display materials and animal mounts to gain a better understanding of key terms such as adaptations, camouflage and warning colors. The children all enjoyed learning about animals they see everyday. This hands-on approach really helped our young learners dive deeper into wilderness animals!